Paula Joule Blake, designer and owner of Joule Designs of Wimborne, studied art at Salisbury College of Art and graduated from the Arts Institute at Bournemouth. Paula is passionate about creating individual designs, especially for you, inspired by the love of making something totally unique. 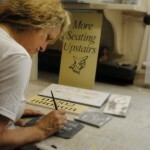 Her design skills will cover almost any subject, creating a pleasing design that will enhance any entrance. If you cannot see anything that suites your requirements then she will design the sign in your desired theme.